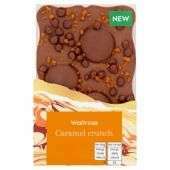 Waitrose chocolate slabs showing as 2 for £2.50 or £2.50 each making them bogof. Actually bought some in-store this morning while getting my 'free' coffee and they were £2.62 each so actually cheaper to get two! Buy while stocks last, Waitrose are to discontinue these products. Very good deal, very good chocolate. "During the row, Hotel Chocolat declared a chocolate “amnesty”, offering anyone who had bought a £2 Waitrose bar the chance to exchange it for one of the chocolatier’s own, which usually sell for £3.95. Thirlwell said the amnesty would be extended until Waitrose had finished selling off its stock of the bars." Does this mean even cheaper hotel chocolat bars? But even at £2.50 for two 90g bars that's still expensive chocolate. Never had the Hotel Chocolate brand, is it really that much better then other brands? But even at £2.50 for two 90g bars that's still expensive chocolate.Never …But even at £2.50 for two 90g bars that's still expensive chocolate.Never had the Hotel Chocolate brand, is it really that much better then other brands? Well I have tried 2 of hotel chocolate products and neither were very nice at all much prefer other brands. It is nice, quite rich and good quality. Just not something you can eat regularly though, I think you would feel sick. Best for special occasions. Taste is subjective, but the quality of the ingredients is without question far, far different. Waitrose is mostly sugar, Hotel Chocolat, cocoa. Even for 2 of these, £2.50 is a lot to pay for 180g of very nondescript bog standard chocolate - even if it does have the Waitrose name on it. Some of the Aldi and Lidl special chocolate bars offer far better value, and are actually much better quality than these Waitrose knock-offs.